Infinity Blade’s original music score, by Josh Aker, is the finishing touch that brings ChAIR’s epic game world to life and fully immerses players in its story. Enter the God King’s tower, explore the Vault of Tears, and relive the battle with the Worker, all from your headphones. Now you can stream the soundtrack of every battle, every cutscene, every moment on Spotify - anytime, anywhere! Listen now! 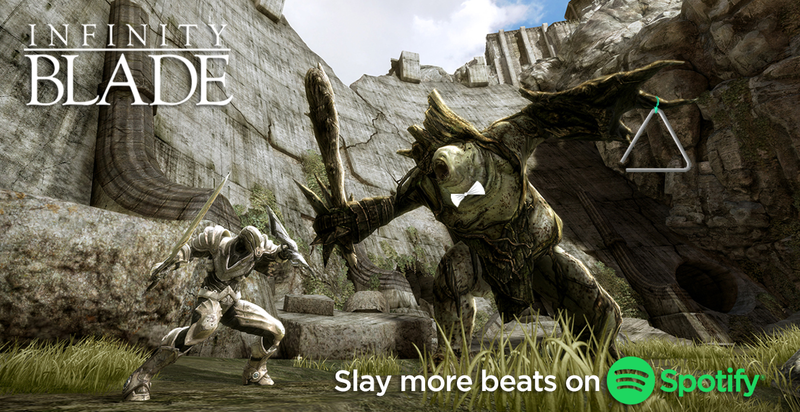 To celebrate the original soundtrack’s Spotify release, we’ve put together playlists inspired by Infinity’s Blade most popular characters: Siris, Isa, Raidriar and the Worker of Secrets. Check out our song picks and prepare to jam along! This playlist represents Siris’s constant struggle between light and dark, good and evil, himself and Ausar. Will his reflection show who he is inside - or is he really, deep down, just vile after all? Isa has places to see, things to steal and targets to hit. She’s more about independent anthems than silly love songs, and this Siris guy isn’t going to change that...much. Maybe a little bit - but she can still knock you out. Raidriar has been alive for a long time, so he has A LOT of feelings. He has feelings about dying and undying as a child. He has feelings about his dad. But most of all, Raidriar has feelings about being the God King. The Worker’s Workout Jams embody his powerful nature, his desire to repeatedly destroy the world, and his fitness goals. Cardio is essential when you have a weakness for chocolate chip cookies, but that's a different story. Everyone knows that global destruction requires peak performance! Keep an eye on our Twitter for some special giveaways. Are the playlists missing a great song? Let us know on Facebook, Instagram, Discord and our forums!